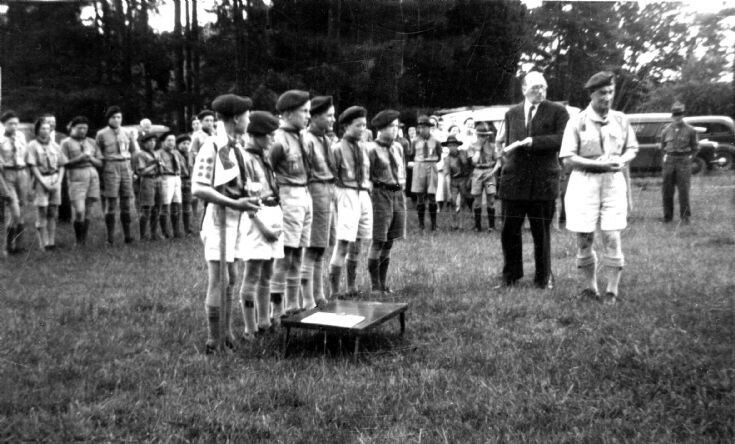 The major inter-troop competition for the scouts in the Mid-Sussex area was the Hardy Cup. General skills of camping and surviving without home comforts were tested over a two-day period. The victors above were the Ist Slaugham Scout Troop based in Handcross. There had previously won the cup over a decade earlier; see picture #1545. The two pictures are not very clear but, from the left, I think the patrol members were 3 Lionel Copeland, 4 Godfrey Parker, 5 Clwyd Masters, 6 Rodney Pattison. No doubt someone will be able to name the other two or correct the names above. The event was held at Walstead, just east of Haywards Heath. Select Open Document to view the presention of the cup.